It has often been said that our generation, that lot that lived through indie in our teens and baggy as we hit University, Britpop for first jobs, are incapable of growing up. There is a certain truth in this. We cling to our youth stubbornly, we still fill gigs (more so in many cases than the generation of the bands on stage), we sustain cd or vinyl sales and magazine subsciptions, we campaigned for, and retained, 6 Music whilst BBC 3, with a younger target generation, went to the wall. Whilst it may be our parents that stole all the houses, pissed off with the oil revenues and destroyed the trade unions and worker's rights by letting in Thatcher, we have done a similar job to culture. Our half dead hand controls not just the mainstream but the perceived alternative as well, marking out a territory that those after us simply cannot break into. So the collision of the ultimate £50 bloke wander through indie courtesy of BBC 4's 'Story Of Indie' and the relaunch of NME has marked a fascinating compare and contrast for those of a certain age. Friday day brought Chris Moyles in a four page exclusive (6 if you count the double page ad that trailed the feature), Friday evening brought Genesis P Orridge and Tony Wilson. Or you could have Taylor Swift for your morning coffee and Morrissey for your evening beer. To those of a certain age, us indie kids that grew up on indie in its strictest sense the dichotomy of the bible being profained and the screen reviving our prophets in such close proximity may have been too much to bear. Whilst I refuse to join the ranks of those proclaiming sell out at the doors of the Blue Fin Building I also refute the more ridiculous notion that the all new free NME has anything in common with its paid for predecessor as espoused by some of its present and former staff. The new NME is a perfectly serviceable entertainment magazine that would do well to add its more outre content (Radar) to those parts already jettisoned (live reviews, serious criticism of any form) to the web. Whilst I buy the NME was always a broad church argument, its new incarnation is nothing of the sort, cutting wildly at one end whilst opening the commercial doors at the other. Leaving in place the celeb heavy Q & A interviews strictly patrolled by the kind of PRs that give my lot a bad rep when we tell people what we do (the whole Mr / Ms won't answer that question thing), the blatant marketing tie-ins and accepting that 300,000 random passers by don't give a rat's arse who Foals are would remove the indignity of the NME 'cover' for any non world famous stars actually being an inside cover wrapped around with a cartoon version of the image reimagined by the marketing department of Netflix. Anything else is self-deception. Where this leaves any sense of alternative music as documented by Mark Radcliffe and a somewhat selective bunch over the last three weeks (that whole Factory / McGee thing got a little wearing and where the hell were XL or indeed, women, in the last part?) is a more twisted debate. NME's fall is, of course, a direct result of a number of factors that mark the slow decline of independence as an attitude and political standpoint rather than an ownership model. What is most salient came from BBC 4, the repeated assertion of bands and labels alike that they didn't do it for the money. 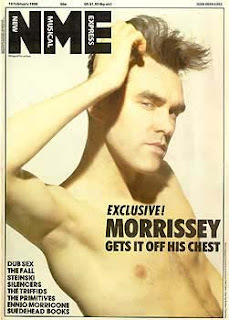 The same was true of NME in that heyday. But then all concerned had a, to quote The Shop Assistants, Safety Net. That option no longer exists, nor does the opportunity to fall flat on your arse as an adult which means no long shots at being in a band, starting a label, becoming a music writer or putting out something that transmits enthusiasm and love rather than market tested certainties. When Jeremy Hunt says he wants us to work like the Chinese and the Americans what he really means is he wants us to feel we have to because, like both those populations, we know that not working will mean penury, illness and a sooner death. Given its new focus the all improved brand NME may well prosper in this brave new world, proffering short attention span hits and shiny baubles to tired commuters and in debt students. I wish it well.